1. Frieth was now a village with a church, a school, a resident curate and a school master (see history of church and school). 2. First Canon Ridley and then succeeding Rectors of Hambleden had a great influence on spiritual life, education and welfare generally. 3. The Firm was established, employing labour and housing its workers. 4. The Lord of the Manor (now the Scott-Murray family) took more interest in the farms, tenant farmers and labourers under his control. 5. The Cripps family were living at Parmoor House employing labour, housing their workers and helping in welfare generally. (see Lord Parmoor's account). C A Cripps QC Baron Parmoor of Frieth Mr. H.W. Cripps, Q.C., was the first of that family to live at Parmoor. He was succeeded by his son Mr. C.A. 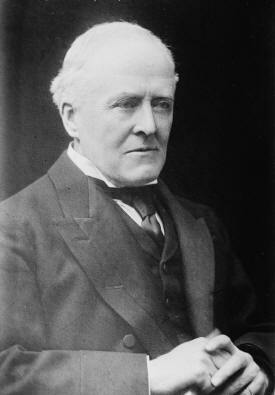 Cripps, Q.C. (later Lord Parmoor) who lived there with his wife and family from about 1880 onwards. The Cripps family were already "landed gentry" of an old family tracing their descent back to Norman times. Father and son bought up land locally until they owned an estate stretching from near Marlow, through Lane End to near Stokenchurch, all Frieth and farms stretching down to Skirmett. Both H. W. Cripps and C.A. Cripps were very successful in their professions, the former specialising in Ecclesiastical Law and the latter in the Law of Compensation and both were engaged in politics. Later in life C.A. Cripps brought much criticism upon himself in political circles by his change in party politics although even in his early political career he had described himself as a "progressive conservative". As regards our own village the Cripps family did much to help financially and otherwise the well being of the villagers. They gave generously to the upkeep of the school and church and in 1898 had the Village Institute built on ground given by West and Collier. Lord Parmmor was very interested in education, particularly the beginnings of Technical Education all over the country and, locally, he encouraged the Men's Reading Room and classes for women and girls in needlework, cookery and housewifery. Men were encouraged to-use their gardens wisely and to grow vegetables on allotments, the Estate's gardeners raised crops for seed, in the early days, and this was distributed. Each year a Flower Show was held in the grounds of Parmoor House. In the early years when food was scarce, free soup was served twice a week from the kitchens at Parmoor. There were yearly treats provided free for children and adults, the children's summer treat and Boxing Day Party and the Harvest Home for the tenant farmers. By 1880 the number of houses in Frieth had grown considerably, there were many more on the hill, some owned by West and Collier and each of the communities listed in the last chapter had grown but Great Frieth more than the others. Many villagers lived in tied cottages. Conditions in the cottages had improved, most of them now had access to a water tank, they had vegetable gardens and most of them had kitchen ranges on which to cook. There was no need now to bake bread at home for there was a baker in the village, the baker would also cook the roast on Sunday or dough cake, for a small fee. Houses were lit by lamps to supplement candles. Food was somewhat better, there was still no butcher in the village but meat could be bought from Marlow or Henley after a shopping expedition by carriers cart or horse and trap and meat was sold locally as a beast was killed. The village now boasted a village shop and those with the means could buy bread, flour, tea, sugar, candles, soap and many other things. Shoes were still made in the village by the cordwainer. Most men still worked on the land, the rest at the Firm and some at brickmaking. The women made lace but now the children went to school, albeit some were unwilling scholars! Disease struck now and again, mostly diphtheria and scarlet fever amongst the children. Life was still hard and wages small but there was room for some relaxation. As well as the yearly treats already mentioned the village had a Reading Room and a Night School, a cricket club and a Drum and Fife Band. (Mr. E. Collier owns a fife and the big Drum is still at the Village Hall). To add to the yearly festivities "Ayres Fair" was held every Whit Monday on the Common by the Prince Albert (Mr. Ayres was the Landlord). The villagers had stalls and there was visiting entertainment, a Merry-go-Round and swing boats. Mrs. Bond who had a shop in her house (now Hilliers) selling home made cakes, made a Fair 'speciality' - cold rice pudding cut out in ld. pieces! 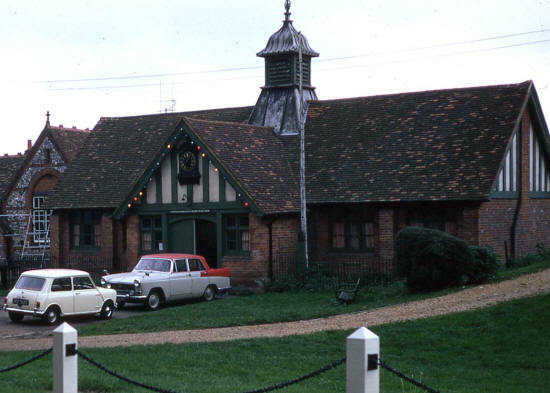 There were three ale houses in the village itself, the Yew Tree, the Prince Albert and the Royal Oak (Barlows) as well as The Pheasant beyond Parmoor and the Brickmakers (called "The Kiln") on Moor Common. Most men had their own particular song and bar games were popular besides the usual ones. "Pitch in the hole" was played at the Prince Albert. There was some heavy drinking as was common all over England at that time. However I am told this never assumed the proportions in Frieth that it did in Lane End and High Wycombe, where it was common practice to pay the men in a public house on Friday night where they would stay till they had drunk their pay away, returning each day and not resuming work till Tuesday morning. Probably the difference was that Frieth was much more of a "Feudal" village and under the influence of Parmoor House and the Church who in fact constituted the "Welfare Services" as well! Certainly people had found Frieth a good place to live in for they came, they stayed, they intermarried - everybody knew everybody else. There was a solid Victorian base of religion and family life, the villagers were law abiding and honest and though still poor by our standard were much better off than many other people in other parts of the country at that time. (See Mrs. Sarah Brown's account).